Kampot City is an old provincial capital with a mix of old French colonial government buildings an red tile-roofed shophouses. Many of the buildings along and near the Kampong Bay River were constructed during the French colonial period. 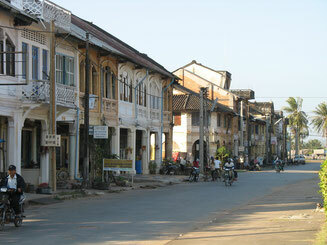 Kampot has a quite different character from the beach town Sihanoukville. In Kampot you can get a taste of provincial Cambodia. Use this town as a base to explore the beautiful countryside with rice paddies, pagodas, little villages, caves, pepper plantions, saltfields ... At the end of the tour relax in a little riverside cafe or restaurant. The trip from Sihanoukville to Kampot takes about 2 hours by car. The road is in very good condition. 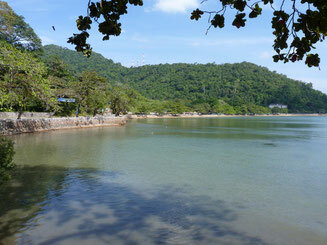 Kep was Cambodia's premier beach town from turn of the century through the 1960s. Kep is still a place to relaxe and explore the rural countryside, Bokor Hill station and nearby caves. Kep is known for its fresh seafood, especially the crab which comes direkt from the ocean to your plate. Take your lunch or dinner in one of the rustic oceanfront crabshacks or picnic platforms. From Kampot to Kep its only 25 km through countryside with smal villages and rice paddies. The price depends on number of participants and the kind of vehicle for the transport.